John R. Hubbard has passed away at 92. John R. Hubbard, a historian and former U.S. ambassador to India who was president of USC in the 1970s, died Sunday at his Rancho Mirage home after a long illness, the university announced. The broad-shouldered and outspoken Texas native, widely known as “Jack,” was 92. During his decade-long presidency, Hubbard was credited with helping to boost the University of Southern California’s finances and academic reputation. But his term also was marked with controversies over donations from the shah of Iran and from corporations doing business in Saudi Arabia. USC’s current president, C.L. “Max” Nikias, said Hubbard’s presidency established a foundation for the school’s subsequent rise in national rankings in scholarship and research. “I greatly admired his keen mind, his quick wit, his passion for history, his service to our country and his love of this university,” Nikias said in a statement. Hubbard, who was an expert on British diplomatic history and U.S.-India ties, continued to teach part-time at USC until he was 91, even if it meant sometimes leaning on a walker. “He was a strong, tough Texan, no question about it,” said friend John Callaghan, a USC associate professor of kinesiology, who also recalled Hubbard as a first-rate scholar with a global perspective. “He really knew a tremendous amount about the growth of the British Empire, its stability and its eventual decline,” Callaghan said. I was pleased to serve on USC’s President’s Advisory Council under President Hubbard. I and many others cut their teeth on politics working in student government at USC. In 1969, Hubbard was named provost and vice president of academic affairs at USC, and the next year he became USC’s eighth president. During his tenure, applications to the school nearly tripled, 10 major buildings were begun or completed, and new programs were established in communications, urban planning, gerontology and hydrocarbon science, officials said. In a clash of Democratic San Fernando Valley titans. But in the new poll done for Sherman’s campaign, he led a three-way “jungle” primary against Berman and Republican businessman Mark Reed with 42 percent, followed by Reed with 26 percent and Berman with 17 percent. In a ballot test of a two-way runoff with Berman in the solidly Democratic district, Sherman got 51 percent to 24 percent for Berman. Under California’s new law, the top two finishers in the June primary, regardless of party, face each other in a November runoff. There are expected to be several intraparty, general election races next fall. The poll, conducted by the Feldman Group, was taken of 600 likely voters in the district Aug. 14-18. It carried a 4-point margin of error on the general election ballot and 5-point margin of error on the primary ballot. 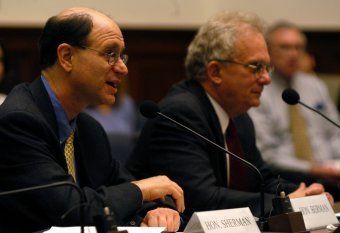 A polling memo from pollster Diane Feldman stated that Berman’s “lower profile” in the area, along with Sherman’s higher favorability numbers, explain Sherman’s strong early edge. “Sherman is simply better known and more popular in this San Fernando Valley district and voters want his visible, local style of representation,” Feldman wrote in the memo. And, the purpose of the poll is to scare Berman out of the race because the top two will move forward to the general election. Sherman is better known in the Valley but Berman is a shrewd campaigner and will have a ton of money to throw at the race. The only impediment is the Republican candidate who is likely to siphon off enough votes to come in second regardless of the fact that he will have no hope of winning this primarily Democratic CD. Well, they could NOT pay me enough to go into San Quentin, Pelican Bay or Corcoran State Prisons and practice dentistry – regardless of the pay and benefits. Jeffrey Wang closed his struggling medical practice in Visalia, California, in 2007 to take a job as a physician treating inmates in Corcoran State Prison, where murderer Charles Manson is locked up. Wang made $382,519 in 2010, including overtime and extra- duty compensation. He was one of almost 100 doctors, dentists and other medical practitioners in the state who got at least $300,000 last year to work behind bars, according to the controller’s office. California prison doctors earn more than counterparts in New York, Texas and Florida, data compiled by Bloomberg show. The highest-paid physician in New York’s penal system in 2010, for instance, collected $200,147, including overtime, according to the state comptroller’s office. The most that a Texas prison doctor can make is about $220,000 annually, corrections officials said. The top compensation for a medical employee in Florida was $230,711 in fiscal year 2011, with no overtime, a corrections department spokeswoman said. Just watch Lock Up on MSNBC on Friday or Saturday and you will understand that practicing in California’s overcrowded prisons is not desirable, in any sense of the word. The California Legislature is in session and considering the end of session bills. An interesting hearing today on the California Death Penalty, which I have been commenting upon for quite a few years over at Flapsblog.com. Sen. Loni Hancock, on a mission to replace the death penalty with permanent imprisonment via SB 490, will host a hearing today on the costs of capital punishment. It begins at 10 a.m. in room 3191 at the Capitol. Amazon really doesn’t want to collect sales tax. The Seattle-based company has now spent $5.25 million to try to put a measure on the June 2012 ballot that would repeal a law requiring online retailers to collect sales tax. According to newly released campaign filings, Amazon made a $2.25 million campaign contribution on Aug. 10. That’s on top of $3 million the online retailer contributed to the initiative in July. Wigglesworth said his committee was working with a “growing coalition of taxpayer groups, consumers, small businesses” to overturn the new online sales tax law — although so far state records show Amazon to be its only contributor. Students starting the school year at California Community Colleges this week will pay higher fees and have fewer courses from which to choose. At California State University campuses, students will find their classes packed, fewer library books available and the ranks of part-time faculty thinned. That dismal picture could worsen if the state’s financial problems force colleges and universities to make additional budget cuts mid-year, leaders of the systems said Monday during a conference call with reporters. As it is, the state’s 112 community colleges will offer 5% fewer classes this fall, Chancellor Jack Scott said. Based on projected annual demand, an estimated 670,000 students who otherwise would enroll in at least one class will not be served, he added. Community college students, whose fees already have risen to $36 per unit for this school year from $26 last year, are likely to face a further increase if state revenue doesn’t meet projections. State funding to the two-year colleges was reduced $400 million for this year. Further cuts would trigger an additional $10 per unit fee increase for spring 2012. That has appeared more likely since a recent report by state Controller John Chiang that California’s tax revenue fell $539 million below expectations in July. Scott said a mid-year increase would be especially difficult because campuses would have to collect the fees from students who had already enrolled for the second semester. If a unique gathering of Californians for a weekend full of talks about government proved anything, it may be that the best chance for consensus lies in the what’s most absent in politics: substantive dialogue. On the last weekend in June, 412 citizens from around the state gathered in Torrance to discuss what’s wrong with California’s system of governance and how it might be fixed. This morning, the backers of the event released their findings at a news conference in Sacramento. Tops on the list: longer legislative terms, an initiative process that allows for amendments by citizens but not by politicians, and a focus on performance measures for state government. The event and subsequent report are the work of a group called What’s Next California, comprised of everyone from activists to academics. While few may expect the work to be quickly embraced by either the state’s warring political factions or gloomy and distrustful voters, it nonetheless helps provide a window into what can happen when people think, talk, and search for consensus. The results were gathered through what’s called a deliberative polling process, where participants are asked opinions before participating in the event, then tasked to engage in several deep discussions with other citizens, then re-asked their opinions on the same topics. In a telephone interview shortly after announcing his retirement, SFSU President Robert Corrigan accused Brown of not doing enough to protect higher education from deep budget cuts. Corrigan, 76, is retiring at the end of the school year after nearly 24 years as the university’s president. He said the state’s budget crisis will take years to resolve. “I think we are looking at a five-year [budget] problem in California,” Corrigan said in a telephone interview. “At my age, I am not likely to be around for five years.” Corrigan plans to return to his research in American history after retiring. “The next president needs to deal with the Legislature and the governor as best that they can,” he said. SFSU is one of 23 campuses in the California State University system that has absorbed deep budget cuts over the last several years. In the last three years alone, state cuts of $84.9 million have forced SF State to raise tuition six times, increase class sizes and merge eight academic colleges into six. Corrigan said he worries that the middle class is being priced out of universities like SFSU. The university had 29,718 students in the 2010-11 school year. You can watch the Live Webcast of the speech here tonight at 6 PM. PDT.